The Creative Convergence Hubs Charrette took place from March 30 to April 1, 2012 and included over 60 participants. 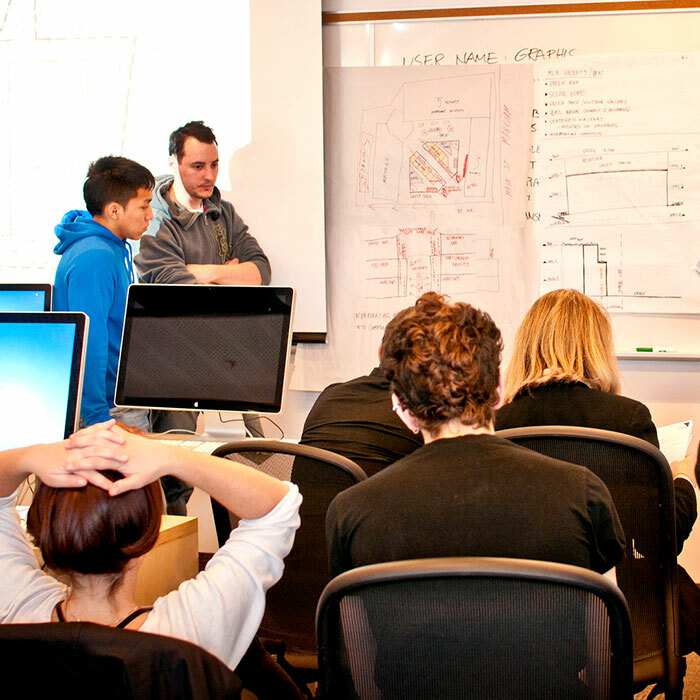 It was a major part of the 2011-2012 curriculum year, during which the IwB partnered with the City of Markham, exploring the challenges of the city as a growing and diversifying suburb. The Creative Convergence Hubs Charrette brought together the IwB students’ work from the whole year. Specifically, the idea that Markham needs ‘creative hubs,’ places where citizens, industry, and public organizations can come together, propose, and execute changes in the city. Importantly, the results of the charrette contributed directly to the IwB students’ final proposal for COLAB, a ‘change lab’ that would encourage community building and engagement in Markham. Based on assigned case study sites in Markham, charrette teams were asked to create design concepts for new ‘convergence hubs’ that would build on local amenities, draw in new creative people, foster development of new businesses, and further community growth. Creative hubs are places where citizens, industry, and public organizations can come together to propose and execute changes in the city. Markham is located on the northern border of Toronto. It has one of the most diverse populations in Canada, just over half of its residents are new Canadians. It is also known as ‘Canada’s High-Tech Capital,’ hosting several hundred high-tech and life science companies. Today, the urban face of Markham is the result of its dynamic growth and evolution. In many areas of Markham, heritage buildings and traditional main streets contrast with suburban pattern development. Abundant large parks and areas of preserved wilderness make the city feel very green, however, large company ‘campuses,’ big-box stores, and shopping malls have followed a traditional suburban development pattern resulting in an extremely car-centric urban layout and low pedestrian life. Like many other suburban cities, Markham is striving to foster its strengths and ameliorate the fragmentation of suburbanization. The Creative Convergence Hubs Charrette focused on creating mixed-use hubs for innovation that would spur new business and bring Markham’s diverse population together. Five teams were assigned to five different sites in Markham: Langstaff East, Enterprise and Main Street, Stiver Mill, 12 Harlech Court, and Main Street. In their designs, teams were asked to include a ‘special feature,’ like a daycare, fitness centre, health clinic, arts and crafts centre, and or digital/ media cafe. The teams were to propose mixed-use building complexes that would incorporate one of the special features, weaving in, when possible, neighbouring site features and businesses. The case study sites were chosen strategically. All of the sites already had new development in 2012 or were slated to be developed. This meant that charrette results were extremely timely and could to be utilized towards future city planning in Markham. Convergence hubs that leverage creative professionals have shown to reinvigorate communities and contribute greatly to economic growth. During the event, charrette teams visited the Centre for Social Innovation (CSI), a highly successful convergence hub in downtown Toronto. At CSI, teams studied how the space worked, in particular, exploring the support needs of creative entrepreneurs and small start-ups. Convergence hubs like CSI provide shared, affordable, and accessible business amenities that enable individuals and small businesses to operate without incurring high start up costs. Charrette teams analyzed their sites to identify what characteristics they would be able to build on and how they could propose creative convergence hubs that would enhance Markham’s local amenities, draw in new creative people and industries, and further community growth. Over three days, five charrette teams worked on their case studies and then presented the results to their peers and a panel of experts, including city officials from Markham and other stakeholders. As many of the sites were slated for development, the presence of Markham’s city officials meant that charrette results could be integrated into Markham’s future development plans. 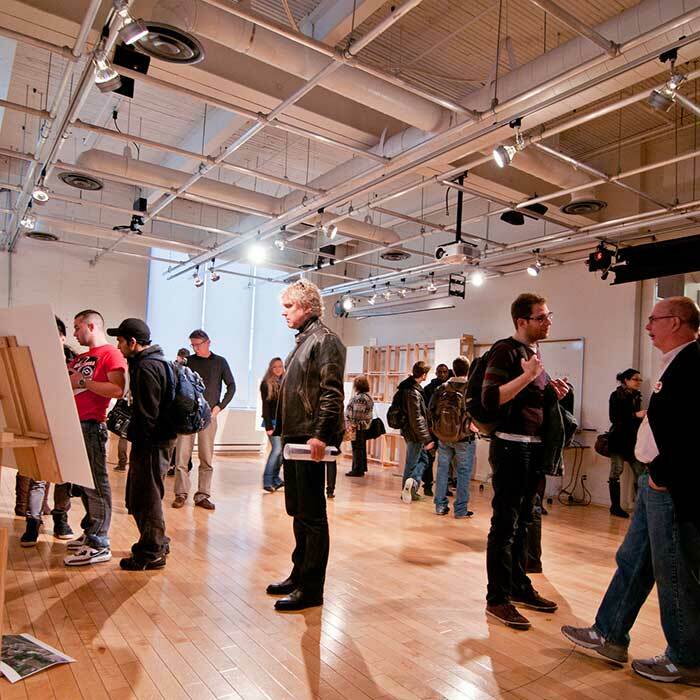 The charrette was an exciting event that brought together many different stakeholders in Markham and led to the proposal for COLAB, the IwB students’ final project for the 2011-2012 academic year that advocated for a ‘change lab’ in Markham. To find out more, view the teams’ charrette proposal summaries below or download the Creative Convergence Hubs Charrette Report. Enterprise Boulevard and Main Street have many desirable features, including residential and transit amenities. The area has a well-featured YMCA (sports gym), GO Station and Highway 407 access. In 2012, it was also a construction site for a new sports complex, to be constructed for the 2015 Pan-Am games (today the Atos Centre). The Yellow Team proposed “Kinnect,” a mixed-used complex for open experimentation and collaboration in digital media with a focus on athletics and human motion. Kinnect provides a live/ work residential area as well as rentable laboratory and office space for interdisciplinary research, incubation and, commercial programs. The Kinnect proposal is community oriented and multi-scaled. Its programming includes hands on workshops through to large scale events and conferences. Stiver Mill is a former grain elevator and mill that has been designated as a historic building in Unionville. The historic centre of Markham, Unionville has many small restaurants, bars, and shops, it is one of the main pedestrian friendly areas of the city. The Stiver Mill building dates back to early 1900s. The Town of Markham has owned the site since 1993 and there have been calls for proposals to restore the mill since 2008. In 2012, the Stiver Mill was still not a usable structure, but the building (and surrounding area) were protected by heritage designation. At the time, the site was periodically used as a farmers’ market, but there was much interest in connecting the structure to the contemporary life of the city. 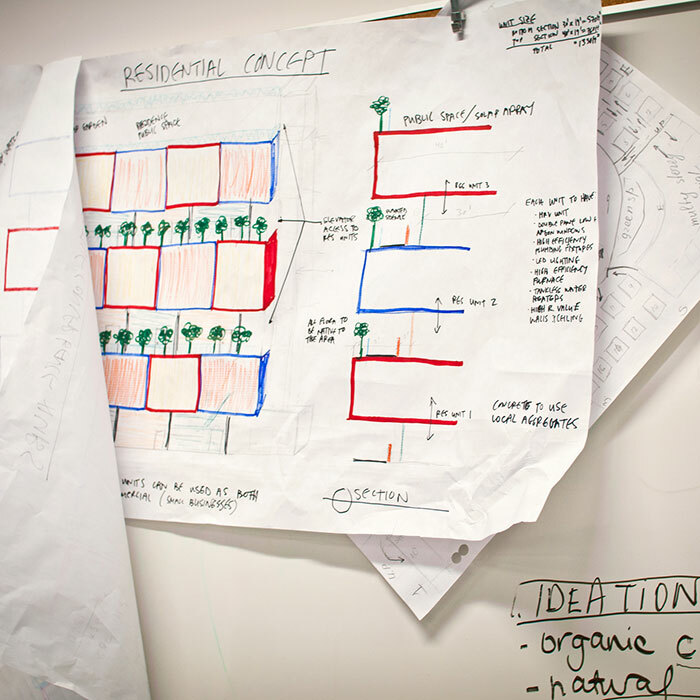 The Green Team proposed the “Creative Learning Commons,” a convergence hub that would accommodate craft, cooking, dance, gardening, music, painting, pottery, and sewing programs. The team’s hub proposal included a daycare centre and a space to continue the farmers’ market. The following year, in 2013, the revitalization of the site went forward. Today the building has been restored and converted to a the Stiver Mill Farmers’ Market and Community Centre! Harlech Court is located in a very small light industrial area, surrounded by suburban residential homes. The area has few amenities, with limited public transit and mainly car access to the site via Highway 401 and Bayview Avenue. There is a nearby mall, but it is cut off from the site by a rail line (still in use). There is also a concentration of residential towers nearby. Team Blue proposed “The Harlech Court Innovation Centre,” a convergence hub that targets graduates and current students, who wish to learn and grow their networks, living independently in an inspiring environment. The proposed complex would operate 24 hours-a-day and would be self-sufficient. Langstaff East is located at the edge of a light industrial area that has developed between Highway 407 and a large cemetery. The area is used mostly by people travelling from Markham to work in Toronto because it is located close to the GO Station, Yonge Street and Highway 407. It is a priority redevelopment site, but it does not yet feature many amenities. The site has the potential to become a transit hub. Team Red proposed The Creative Convergence Project, which aims to develop dynamic collaborative innovations hubs on the grounds to promote Markham’s diversity and its creative sector. Main Street is Markham’s central artery, it runs north-south through the city and holds many of its heritage features. The area has many amenities and is close to major public transport and car routes. In 2012, Main Street was slated for development into a new condo building to promote higher density residential living. Using the planned condo development, the task of the Purple Team was to propose a convergence hub for the ground floor/ base of a larger tower, thereby creating proposals that could be used for the planned development. The Purple Team proposed a convergence hub that incorporates arts and crafts production into a special feature building that includes work, presentation, gallery, and teaching spaces. The proposal also focused on making a sustainable building that incorporates art programming with green building features. The building incorporates passive cooling/ heating, a living wall, green roof, public green space, rain water collection, rammed earth walls, local and recycled materials, solar and geothermal energy collection, all in an inviting and pedestrian-friendly site.